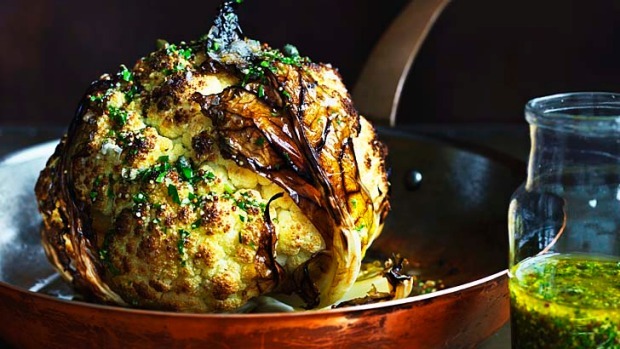 This whole-roasted cauliflower certainly has "wow" factor. For the faint-hearted though, it can be broken up, boiled and the dressing poured over. Also, try the dressing poured over broccoli or beans. Delicious! Put oven rack in the middle position and preheat oven to 220°C. Lightly oil a baking dish that will fit the cauliflower. Trim off the outer cauliflower leaves. Cut away the base of the stalk so the cauliflower can sit flat, then cut a cross into its base. Drizzle 2 tbsp olive oil over the top of cauliflower and sprinkle with 1/2 tsp salt. Bake cauliflower until tender, about one hour (depending on size). Check by piercing the cauliflower with a paring knife, which should go through easily. Transfer to a serving dish. Whisk together lemon juice, mustard, capers, parsley and remaining 1/2 tsp salt in a small bowl, then whisk in remaining 1/4 cup olive oil. Drizzle cauliflower with dressing and present the cauliflower whole, with a butter knife and serving spoon for cutting and serving at the table.